Cover illustration. 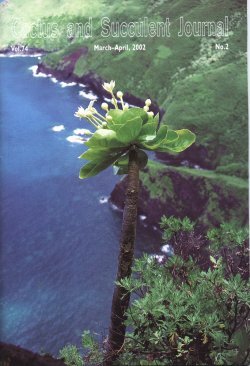 Brighamias are lobelia relatives and about the only succulents native to Hawai'i, as is discussed in this issue by Dylan Hannon and Steve Perlman. Of the two species, B.insignis is sometimes grown, but the subject of our cover B.rockii is rarely seen either in collections or in habitat. Here it is, growing on preciptous cliffs above Haupu Bay on the island of Moloka'i. Mr Perlman is the intrepid photographer.